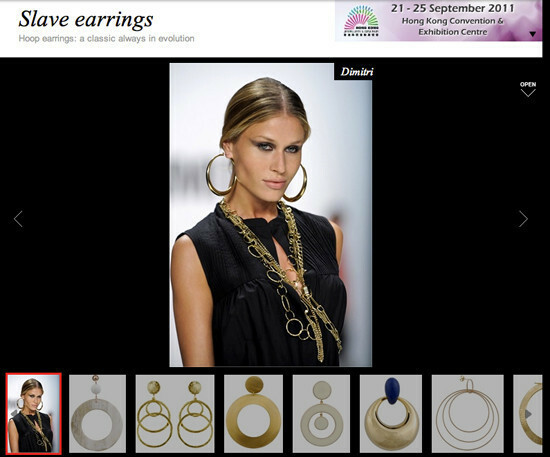 'Slave Earrings' On Vogue Italia: Offensive Or Innocent? Reading international fashion magazines can be tough because of the language barrier. Words appear out of place, phrases get lost in translation, meaning gets misconstrued. But Jezebel has confirmed that Vogue Italia's "slave earrings" is not, as we had hoped, a mistranslation. If the name brings to the mind the decorative traditions of the women of colour who were brought to the southern Unites (sic) States during the slave trade, the latest interpretation is pure freedom. Colored stones, symbolic pendants and multiple spheres. And the evolution goes on. On the one hand, should the enslavement of Africans in the United States be mined for style inspiration? That just feels wrong. But on the other hand, it is true that there are several cultural references that originated in that era, from music styles to folk art traditions. So is it completely wrong to cite a jewelry trend from the historical moment as well? The point, it seems, is that Vogue Italia flippantly references the slave trade as an inspiring moment for "decorative traditions," glamorizing slavery with an ignorant touch it seems only Italians can effect so well. Head to Vogue.it to see the feature... and, if you like, browse some nice pairs of "slave earrings." UPDATE: In light of all the poor press, it looks like Vogue Italia has changed the name of the feature from "Slave Earrings" to "Ethnic Earrings" (see the new headline here). Strange, however, that the magazine chose the bland, imprecise descriptor "ethnic." If they meant African American, couldn't they have just said that? UPDATE II: Franca Sozzani, editor-in-chief of Vogue Italia, has released a statement apologizing for what was supposedly a mistranslation. As printed in the Guardian, Sozzani's statement said, "We apologise for the inconvenience. It is a matter of really bad traslation (sic) from Italian into English. The Italian word, which defines those kind of earrings, should instead be translated into 'ethnical style earrings'. Again, we are sorry about this mistake which we have just amended in the website."